The Rudderless Ship that is the Ottawa Senators - The Point Data-driven hockey storytelling that gets right to the point. After making it to Game 7 of the Eastern Conference Final in 2016-17, the Ottawa Senators believed they had a team that would contend for a championship once again last season. It would appear they had no idea a mountain of evidence suggested they were an average team at best that overachieved thanks to an unsustainable level of goaltending, which masked a myriad of issues. In an ongoing attempt to be more transparent, the Senators invited select members of the media to their offices last week. We’ll get to some of Pierre Dorion’s quotes in a moment but first, let’s look at the red flags that were so apparent a year ago when the Senators started the season believing they were a team capable of another deep playoff run. In 2016-17, at even-strength, the Senators ranked last in offensive zone puck possession, 2nd last in offensive zone turnover rate, which measures how often a team turns the puck over per puck possession, and 3rd last creating shots from the slot. They rarely had the puck in the attacking end, when they did have it they turned it over at a high rate and as a result, they produced very few scoring chances. Defensively, Ottawa spent the second most amount of time defending in its own end, had the worst defensive zone turnover rate in the league and yet its goaltenders still posted the 8th best save percentage in the NHL. The Senators finished with the 2nd best team save percentage on shots from the slot and ranked 1st on shots from the inner slot. At even-strength, Craig Anderson finished the season with a actual vs expected goals against of -0.49, per-game. What that means is that Anderson saved his team almost half a goal per game, relative to league average, based on the quantity and quality of shots he faced. A distant second was Braden Holtby at -0.34. Goaltending masked a ton of issues and the Senators, seemingly, had no idea. Last season, the Senators, once again, ranked last in offensive zone possession. They were 3rd worst in offensive zone turnover rate and 3rd last in shots from the slot. Defensively, it was the same story as the year prior with Ottawa ranking second last in the amount of time it spent defending in its own end and last in defensive zone turnover rate. However, the goaltending swayed 180 degrees as Ottawa finished 2nd last in save percentage and 2nd last in the standings. 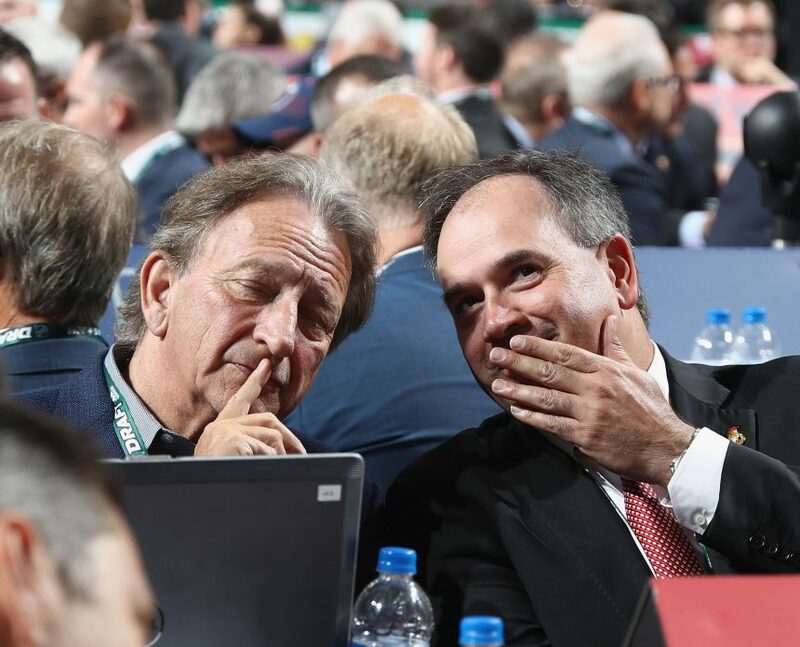 Had Dorion and the Senators understood that they were likely not a playoff team from the beginning, maybe they wouldn’t have traded their first-round pick to Colorado for Matt Duchene which, as Dorion put it at the time, “Puts us over the top.” At the very least they could have lottery protected it. But the Senators clearly don’t know what they don’t know. It bit them last season and it’s going to bite them again this season. No, it’s not. You become a better defensive team by playing less in your own end, managing the puck effectively when you have it and getting it back when you don’t. As mentioned, the Senators spent the 2nd most amount of time of any team in their own end last season, had the highest turnover rate and also had the lowest defensive zone takeaway rate, at 24%. Call it a lack of effort if you want. I’ll call it a lack of talent. 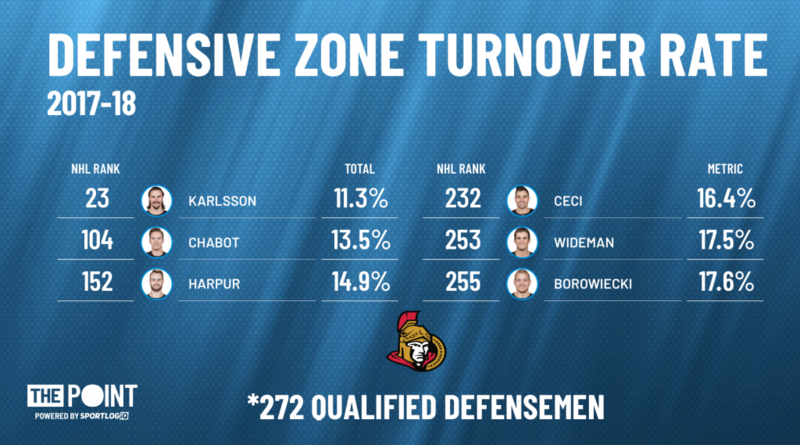 Here’s a look at the Senators six most used defensemen last season (who finished the year with the team), their turnover rate in the defensive zone and where they ranked out of 272 qualified defensemen. Ottawa had one defenseman in the top-100 and they traded him to San Jose. Dorion also stated the club would move away from a passive approach and deploy an “unrelenting” forecheck. It’s true – the Senators attack was passive last year. At even-strength, Ottawa recovered the fewest loose pucks and ranked 2nd last in takeaways in the offensive zone. As for winning pucks battles, the Senators had a success rate of 34% in the offensive zone – good for 29th in the league. End result, the Senators ranked 27th creating scoring chances off the forecheck, averaging 2.9 per game. Sending the second forward to apply pressure will likely create more offensive zone possession and, as a byproduct, enable Ottawa to spend less time in its own zone. However, this approach is unlikely to produce more goals. Gain the blueline with possession – like the Lightning and Penguins, who led the league in controlled zone entry success rate and also ranked 1st and 3rd in goals. Ottawa ranked 20th in entry success rate, 25th in goals. Get the puck behind the goal-line, win a battle and create a quick scoring chance. As mentioned, the Senators ranked bottom-3 winning puck battles in the attacking end last season. Embracing analytics would greatly benefit the Senators, an organization that understands less about its own team than most of their opponents. Dorion said, “We will embrace the power of data and insights to measure our impact.” How, and with what data? The Senators do not have any analytics staff listed on their website and the entirety of their analytics effort in recent years has consisted of consulting with a public servant who moonlights as their “analytics department.” A majority of teams employ at least one full-time analytics staff member – some teams have departments dedicated solely to data research and analytics. Believe me, I would love nothing more than to be proven wrong. However, the decision-makers in Ottawa haven’t shown they understand what the team’s deficiencies are, how deep they run or how to fix them. These same people are the ones leading “the rebuild.” A rebuild that saw the most talented player in franchise history dealt to the Sharks for two depth players, two mid-level prospects, a 1st and a 2nd round pick. Underwhelming is an understatement. Know what you don’t know. The Ottawa Senators clearly don’t and the more transparent they try to be the more evident it becomes.